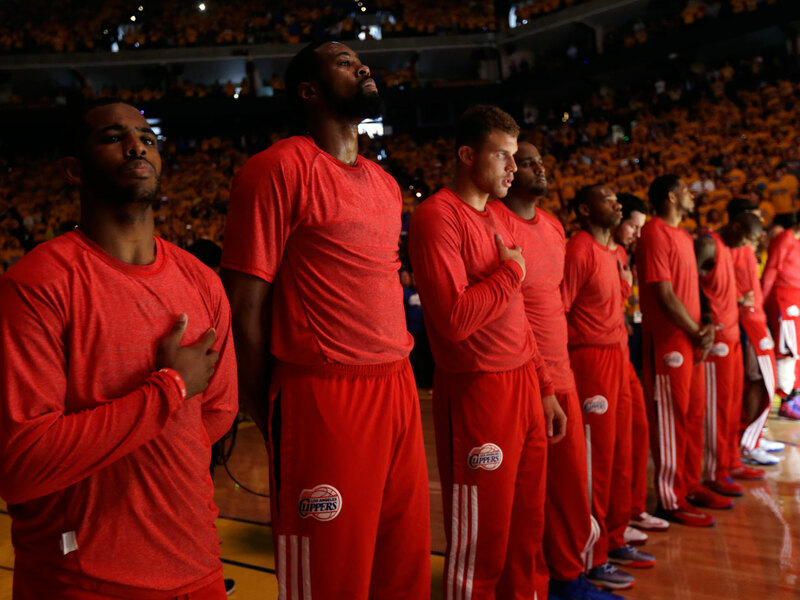 OAKLAND, California - The Los Angeles Clippers chose not to speak publicly about owner Donald Sterling. Instead, they made a silent protest. In response to Sterling's purported comments urging a woman to not bring black people to his team's games, the Clippers on Sunday let their uniforms become a show of solidarity. They ran out of the tunnel for Game 4 of their first-round playoff at Golden State wearing their warmups. Then they huddled at center court and tossed their warmups to the ground, going through their pregame routine with their red Clippers' shirts inside out to hide the team's logo. Players also wore black wristbands or armbands. They all wore black socks with their normal jerseys. "It's just us, only us. We're all we got," Clippers star guard Chris Paul could be heard shouting to teammates before they ran out. The Warriors' sellout crowd of 19,596, decked out in gold shirts, booed the Clippers - as they always do - during introductions. Sterling's wife, Shelly, was sitting courtside across from the Clippers' bench. Commissioner Adam Silver had said Donald Sterling would not be at the game. Clippers coach Doc Rivers said before the game that he would remain the only one to speak for the team on this, saying players want to remain focused on basketball. Even he, though, acknowledged that has not been easy since TMZ released the alleged recording of Sterling on Saturday. "Our message is to play," Rivers said. "Our message is that we're going to let no one and nothing stop us from what we want to do. And I think that's a good message. I really do. I think that's the message we're trying to send. And if we can pull this off all the way, I think that would be a terrific message." While the Clippers wanted to let their play do the talking, other NBA players continued to speak out on the subject. Some talked about the hurt Sterling's alleged words caused. Others urged Silver to take an aggressive stance against Sterling, who has a history of alleged discrimination. Most of them hoped Sterling would be removed as the team's owner someday soon. Earlier Sunday, President Barack Obama described the alleged comments as "incredibly offensive racist statements," before casting them as part of a continuing legacy of slavery and segregation that Americans must vigilantly fight. "We're more than basketball players," Wizards guard Garrett Temple said. "We're human beings, first and foremost, and when you hear something like that, it's very unfortunate that whoever that is talking feels that way, and I don't think there's any place in this game or in the world, for that matter, for thoughts like that." Miami Heat star LeBron James said Silver needed to take action, going so far as to suggest "there is no room for Donald Sterling in our league." Lakers star Kobe Bryant wrote on his Twitter page that he couldn't play for Sterling. Warriors coach Mark Jackson, who played for the Clippers from 1992-94, said he could forgive Sterling but couldn't play for him right now, either. Jackson also wanted to make clear that the audio affected his team, too. He said they spoke about the comments Saturday and decided to use the issue as a platform to spark change. "You stand up there and you answer questions as an African-American man," Jackson said, "and you sound intelligent and you carry yourself and conduct yourself to answer and let people know." Magic Johnson, on the people who was allegedly a target of Sterling's remarks, said he felt bad for Chris Paul and others. He also told CBS Los Angeles he was perplexed by Sterling's comments. "Let's go back when I first got here in 1979. Dr. Buss took me to my first real party at Donald Sterling's house in Malibu for his annual BBQ," Johnson said. "Ever since then, since Dr. Buss introduced me to him at the time he bought the Clippers, we've been out, we've had lunch and even shared meals to talk about his team, so I thought we had a sort of a friendship, even though it may be a distant one. I respect him, I thought he respected me, but when these comments came out, it hurt. It didn't hurt me as much personally as it hurt me for all African Americans." The Clippers-Warriors game in Oakland provided a bigger platform than anybody in the organization could remember in the past two decades. The Warriors said they had more than 100 credential requests since Saturday for a total of about 220 media members approved. The team said there were only about 140 to 150 credentialed media for Game 3 on Thursday, and there were about 60 for regular-season game this past season. For the players, concentrating on the game might have been the toughest task. "As much as this is about basketball, this is life," Rivers said. "And our guys, they have family. They have friends. And that have cellphones. And I can't imagine how much they've been pulled on and talked to and what you should do and what you shouldn't do and what you should say."